Twenty-five years ago today, President George H.W. Bush announced the execution of Operation Desert Storm. It was not only a historical geopolitical moment that changed the course of human events but it is widely seen as the wide-scale introduction of modern “smart” warfare driven by miniaturized computer technology and reliance on precision air power. Desert Storm’s goal was to expel Iraqi forces from neighboring Kuwait, which Saddam Hussein’s military had invaded months before. The U.N. had put forth the deadline of Jan. 15 for Iraq to withdrawal from Kuwait, which was never adhered to. As a result, the U.S. and its broad coalition began an air campaign against Iraq—the likes of which the world had never seen. Over five weeks coalition aircraft rained weaponry down from skies over Iraq and Kuwait. Then ground forces stormed across the deserts of Saudi Arabia and into Kuwait and Iraq. Just just over four days after beginning the ground assault, Iraq capitulated and a ceasefire was agreed to. The war was a supernova-like event for the U.S. military, a big capstone showcase of advanced American combat capabilities that were acquired in the last stretch of the Cold War. 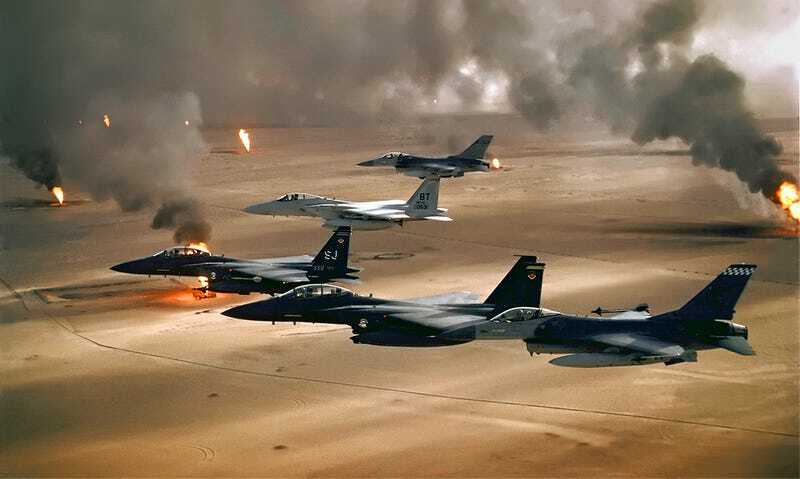 Yet Desert Storm’s fairy tale-like execution clearly misled future power players as to the limits of air power and the danger of large-scale ground engagements. Force size: Approximately 670,000 troops from 28 countries, 425,000 of which were from the United States. We will be featuring posts about Desert Storm all week to mark this anniversary.